As far back as 1839, a lighthouse marked the entrance of the Kalamazoo River, which curved northward to the lakeside town of Singapore. Here trees from the surrounding forests on the western side of Michigan were processed by several mills. The river curved east in a loop and then south again, flowing past the tiny settlement of Saugatuck. The village had been established a few years earlier, before the waterway widened and narrowed on its way to Allegan and the town of Kalamazoo. 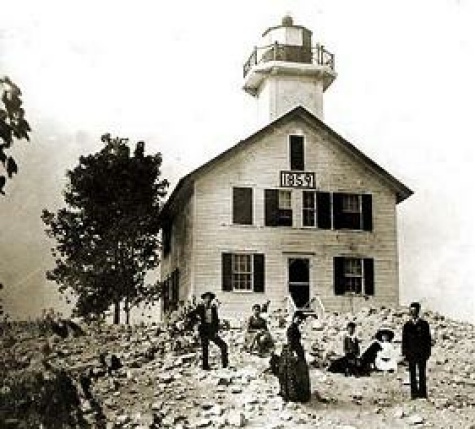 The wind and shifting sand dunes along Lake Michigan’s shoreline soon became a problem, however, filling the Kalamazoo River’s mouth and eroding the area around the stone lighthouse. The sand dunes also affected Singapore once the forests had been cut down. Wind constantly blew sand into the workers’ houses. Village residents moved upstairs to live, but were forced to abandon the houses after the mills closed. Back at the river’s mouth, the Sixth Order Fresnel lens installed in the lighthouse proved superior to the old Lewis lamps. Despite constructing a protective barrier of wood around the foundation, the stone lighthouse collapsed in the late 1850s. Although Federal funds were approved in 1858, the second lighthouse wasn’t completed until 1859. Built farther inland on a small bluff, the two-and-a-half story wooden structure had a solid foundation of timber, cast iron pipes, concrete and limestone blocks. Its square tower thrust fifteen feet upward from the roof, with a cast iron octagonal lantern that held a new Fifth Order Fresnel lens. Its signal could be seen by cargo and passenger ships plying the lake and provided a guiding point between the South Haven Pier Lights twenty miles to the south, and Holland’s light at the opening of Lake Macatawa ten miles to the north. Ten years later, improvements were ordered at the river’s mouth. Protective wooden piers, filled with stone, marched on either side of the river; the north pier was extended further to keep the dune at bay. By 1873, more Federal funds helped to extend both piers further into the lake. A timber skeletal tower was established on the south pier’s end and the station’s Fresnel lens installed. Keeper Samuel Underwood had to row across the river several times each day to service the light. In 1878, keeper George Baker was appointed to replace Underwood. That came to an end in 1892 when a steamship plowed into the south pier and severely damaged the tower. The intact Fresnel lens was returned to the lighthouse. Despite all the improvements to the piers, drifting sand continued to plague the river’s mouth. The ox-bow shape with its dangerous shoals made it difficult for ships to maneuver around the double turn. Some of the roofs and upper floors were still visible in the ghost village of Singapore around the turn of the century. Work began in 1904 to cut a channel straight from Lake Michigan to the top of the ox-bow, a mile north of the old river’s mouth, effectively cutting off the lower portion of the river. 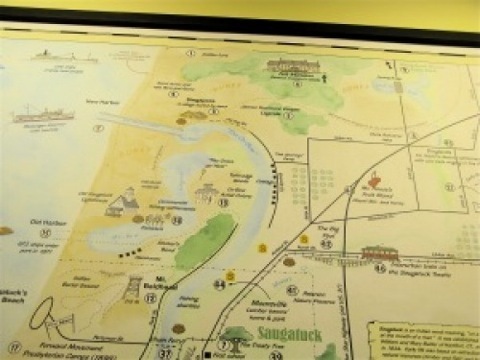 When the project was finished in 1906, steamships brought more tourists through the new channel to the resort village of Saugatuck and its sister village of Douglas. The new channel also allowed the basket factory and fruit farmers to send more of their products to larger cities beyond the local area. In 1909, the U.S. Lighthouse Service established a flashing red pier light at the south pier of the new channel. Kalamazoo River Point keeper George Sheridan performed double duty to maintain the Fresnel lens at the lighthouse near the river’s mouth and the pier light. 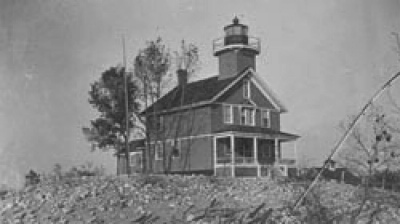 Sheridan, son of South Manitou Island lighthouse keepers and the only professional to serve at this station, remained until 1914 when the north pier’s solid white light was established. The River Point Lighthouse on the bluff was decommissioned, its last day of service on October 16th. Sheridan’s wife and children remained in Saugatuck, however, after he was appointed to serve at another lighthouse. The structure, minus its lantern, and the outbuildings were leased for twenty years by the Ox-Bow Summer School of Art. Vandalism and deterioration from harsh winters took their toll. The government sold the property to the Deam family in 1937. After being used as a family vacation home, the lighthouse was leveled by a tornado in 1959. The owners salvaged some material and built another cottage, in a similar style, on the foundation. This cottage is still visible if you climb the dune north of Oval Beach to the privacy fence. The dune completely filled in the old river’s mouth and sealed it. You can walk north to the pier lights at the channel, and also visit Ox-Bow’s school to view the narrow lagoon and the old pilings along the edges. The lagoon is cut off now due to the dunes. Anyone wishing to see a small scale replica of the old lighthouse should visit the SS Keewatin Museum at the Douglas waterfront near the highway bridge. 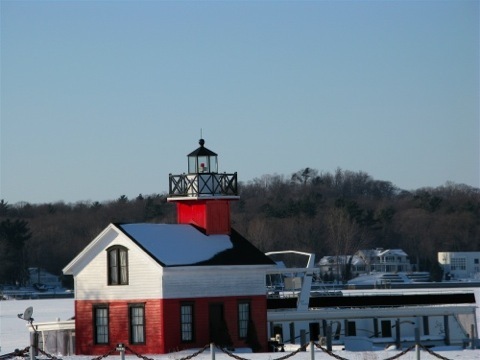 Meg Mims features the Kalamazoo River Point lighthouse and Saugatuck's Dance Pavilion in her mystery FIRE POINT. Artist Sydney Sinclair, visiting the summer resort of Saugatuck, Michigan, finds the half-burned, strangled female keeper at the lighthouse. Sydney draws a sketch from a plaster death mask to help verify the woman's identity, but her efforts prove the victim is not the keeper after all. Sydney faces betrayal from friends and uncovers village secrets that lead to a second murder -- and sets her directly in the killer's path.